Although Southeast Ohio was the first part of the state to be settled, today it also the least populated area of the state. The southeast region is rugged country by Ohio standards. The foothills of the Appalachian Mountains begin in Southeast Ohio. The area has deep river gorges that snake around the hills, but very little precious farmland. Of course there are farms of all sorts in the southeast, but not on the large scale operations found elsewhere in the state. Southeast Ohio is home to the Wayne National Forest that covers over 230,000 acres of hilly woodland that is ideal for back country activities such hiking, camping with over 300 miles of trails. There are also special areas designated for off-roading. Fishing, bird watching, and equestrian riding are also main activities found in this area. Much of Wayne National Forest land is reclaimed coal mining lands that have been preserved by the federal government. Vinton County is in the heart of southeast Ohio and it is filled with rugged beauty and rustic vistas. According to the the Vinton County Convention and Visitors' Bureau, the county is more than 70 percent wooded. Within Vinton County borders are several State Parks, a State Forest, and part of a National Forest. We are home to more than 70 miles of trails for hiking, horseback riding, mountain biking, and backpacking. Nearby, there are over 300 miles of trails for off-road vehicles, hikers, and horseback riders. Plus: historic covered bridges, quilt barns, and a haunted railroad tunnel. With a name like Moonville, a visitor might expect to find something out of the ordinary. Throw in the rumors that something is haunted, and you've got the perfect out-of-the-way location to do a little exploring. In the mid to late 1800s, southeast Ohio was a treasure of natural resources that included iron, coal, oil, and timber. Because of the rugged terrain it was difficult for horse-drawn freight wagons to move through the hills. However, with the advent of the railroad, rail lines could be built with plenty of engineering to reach back into the hollows and valleys to bring out these natural resources. Small communities grew up around these rail "centers." One of those spots was a really isolated place called Moonville. It was here that about 100 folks lived. It was also home to what old-time railroad workers referred to as the most isolated stretches of track on the Baltimore and Ohio line from Missouri to West Virginia. It is said the town housed workers from the Hope Iron Furnace located near Lake Hope. 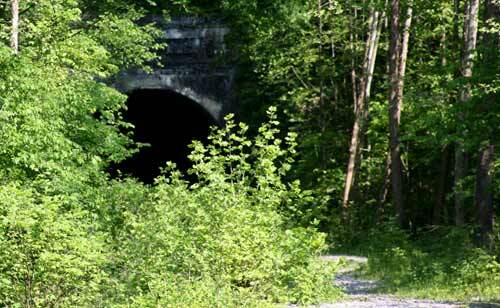 Although the town and tracks are long gone, the Moonville Tunnel remains. It is close to 100 yards long and was originally built in the mid 1800s and it is just creepy even without knowing about its haunted history known as the "Moonville Ghost". Having never seen the Moonville Ghost, I can't really comment on its validity. Some say it is the ghost of an intoxicated man that was killed by a passing train in the 1850s. Some say that at certain times they can see a light that appears to be a waving lantern. Another story tells about the young girl that was crossing the trestle just outside the tunnel and was thrown to her death in Raccoon Creek. Is it haunted? Find out for yourself. Just standing inside the tunnel and listen... you'll hear all sorts of weird sounds echoing through the long dark tunnel. At the heart of Lake Hope State Park is the 120 acre lake (electric motors only) tucked into the Big Sandy Run valley of the Zaleski State Forest which offers miles of hiking and bridle trails, cross country skiing, ice fishing and a 600' beach for swimmers. Site camping and cabins are available for over-night adventures. Lake Hope might be best known for its hummingbird feeding program that allows visitors during the summer months to sit down and hand-feed hummingbirds that are plentiful in the area. 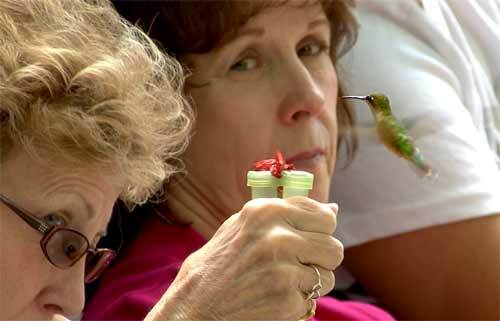 Hand-feeding the Ruby-Throated Hummingbirds found at Lake began when park Naturalist Dave Sapienza was replacing a filled hummingbird feeder when he was startled to see an eager hummingbird buzz in for a quick sip. It was the beginning of a very popular program in the park. Each year, hundreds of visitors take part in the hand-feeding that is offered from early July through August, Wednesday - Sunday between the hours of 1 and 3.